Aikatsu Friends! – 011 | Mezashite! Hello, Coco-chan. How can I make a cute idol girlfriend? Kimi wa dare to Friends wo suru? Honestly, my first time watching this episode I thought it was just average. Thankfully that was only due to a couple things that I’ve pinpointed and come to terms with, and upon multiple rewatches it stands out as yet another fabulous episode. However, I have absolutely no idea what to expect for next week, which just makes it all the more exciting. 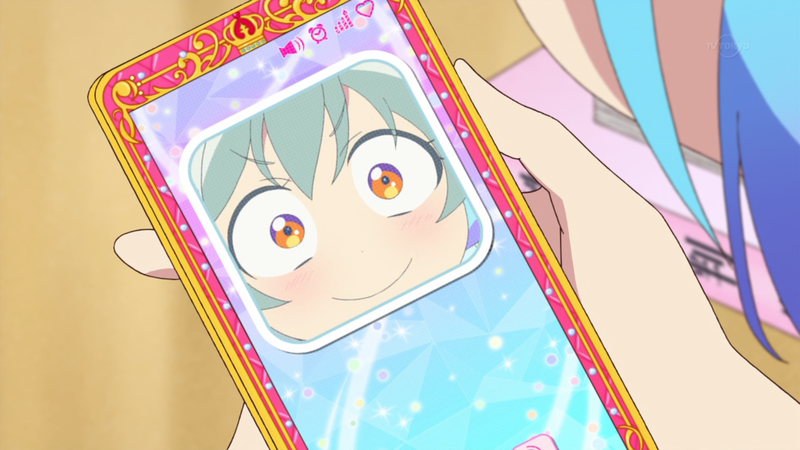 This entry was posted in Aikatsu Friends! by Akatsukin. Bookmark the permalink. Thanks for the subs. Coco-chan was really cute this episode. Given all the sensors these smartphones have nowadays it’s no wonder if you hit or shake it crazily to show AI that is being stupid it’s rightful place. This episode was good, but it also made me sad because we probably won’t see Nako again, and we never even knew her Friends unit name. Mmmmm, you never know, we’ve seen her twice now. Just you wait for the practice Friends Cup that will inevitably happen–Nako will come in fourth place (after Honey Cat, Pure Palette, and whatever third group appears as the rivals that isn’t Love Me Tear). Is it just me, or is it a HUGE coincidence that this episode and its sequel aired during Pride Month? Aikatsu continues to be pretty gay. I definitely enjoyed that. Coco getting all embarrassed was cute too. I can’t believe the look on Coco’s face!